Have you ever heard – or even used – the phrase: “Come on – move it Grandma Moses!”? It’s a phrase commonly used in reference to slow drivers, even slow walkers. Most people, including myself, assume(d) that Grandma Moses is a made-up moniker. In reality, Grandma Moses was a real person – an internationally acclaimed American painter. She is also what I refer to as a fearless brand. Let me introduce you to her. Anna Mary Robertson was born on September 7, 1860, in Greenwich, New York. She was the third of ten children. The family lived on a farm where Anna and her siblings did chores when not attending the nearby one-room school house. The two would eventually settle on a farm of their own in Virginia’s Shenandoah Valley. Anna and Tom had ten children, but sadly, only five of them survived past infancy. The family move back to New York in 1905, where they operated a farm in Eagle Bridge. At age twelve, Anna went to work at a wealthy neighbor’s farm. She continued to work on farms for years, cleaning, cooking, and sewing. When she was twenty-seven, she met and married Thomas Moses, a hired farm hand. Farming is hard and time-consuming. There’s not a great deal of time for hobbies or casual pursuits. However, as a teenager Anna discovered an interest in art. When she had time and materials, she dabbled in painting and chalk drawings. However, she didn’t complete her first work until 1918. In the years that followed, Anna had little time for painting. In 1927, Thomas died, leaving the running of the farm to Anna – then sixty-seven. Fortunately, she had help from her sons. To help fill her time and address her grief, she began embroidering pictures in yarn. At the age of seventy-six, however, arthritis robbed her of that ability. She returned to painting. Anna was self-taught, with a style best referred to as primitive. Inspired by Currier & Ives prints and a lifetime on farms, she painted scenes depicting the beauty of nature and the happiness she experienced. In 1938, a few of her paintings were on display at the local store. Louis Caldor, an art collector on vacation, bought every piece. He then went to Anna’s home and bought the other paintings she had there. At the tender age of seventy-eight, Anna the painter was discovered. The following year. Caldor displayed three of her paintings at the Contemporary Unknown Artists show at New York’s Modern Museum of Art. The following year she had a one-woman show, also in New York. That show made her known, in fact, one art critic, after learning her story, dubbed her Grandma Moses. The name caught on, becoming the name she became recognized by as an artist. She became famous in short measure. What followed were more shows, international demand, a variety of awards and global recognition as Grandma Moses. She was also referred to as The American Primitive, a direct reflection of her painting style. Her paintings captured happy times from her youth, typical farm activities, open fields, storms, dances, holidays – life. She painted from memory, often capturing a vision from the past, then shutting everything out until the image became a painting. At the age of ninety-one, in 1951, she published her autobiography titled, My Life’s History. Anna Mary Robertson Moses – Grandma Moses – died on December 13, 1961. She was 101. What makes this woman a fearless brand? It’s not her accomplishments – it’s what drove those achievements. 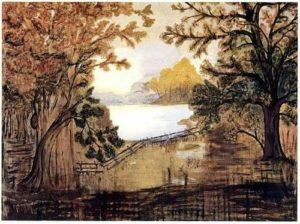 Throughout her life, Anna “Grandma” Moses accepted life on life’s terms. She was comfortable with herself as a person. This was true of her as a child, a wife, a mother, a farmer, and ultimately a world-renowned artist. It’s because of her passion for all aspects of her life. Her ability to embrace her purpose and adapt as her situation and role changed. Her persistence carried her through the difficult times and the good times. Her passion, purpose, and persistence allowed her to make the most of her talents, achieve everything she set her mind to, and remain completely comfortable with the person she was. achieve your goals embrace your passion, find your purpose, be persistent and authentic. Doing so will ensure that you make the best of what life offers you. Have you ever heard – or even used – the phrase: “Come on – move it Grandma Moses!”? It’s a phrase commonly used in reference to slow drivers, even slow walkers. Most people, myself included, assume that Grandma Moses is a made-up moniker. Anna Mary Robertson was born on September 7, 1960, in Greenwich, New York. She was the third of ten children. The family lived on a farm where Anna and her siblings did chores when not attending the nearby one-room school house. In 1927, Thomas died, leaving the running of the farm to Anna – then sixty-seven. Fortunately she had help from one of her sons. To help fill her time and address her grief, she began embroidering pictures in yarn. At the age of seventy-six, however, arthritis robbed her of that ability. At the tender age of seventy-eight, Anna the painter was discovered. The following year. Caldor displayed three of her paintings at the Contemporary Unkown Artists show at New York’s Modern Museum of Art. The following year she had a one-woman show, also in New York. That show made her known, with one art critic, after learning her story, dubbing her Grandma Moses. The name caught on, becoming the name she became recognized by as an artist. It’s because of her passion for all aspects of her life, her ability to embrace her purpose, and adapt as her situation and role changed. Her persistence carried her through the difficult times and the good times.